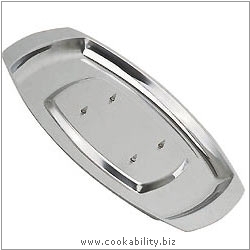 Traditional meat dish made from stainless steel and highly polished. The newer version now has five spikes and wider carving area to keep the meat held securely whilst you carve. For perfect presentation. Photography needs updating.